Text entry for smart eyewear is generally limited to speech-based input due to constraints of the input channels. 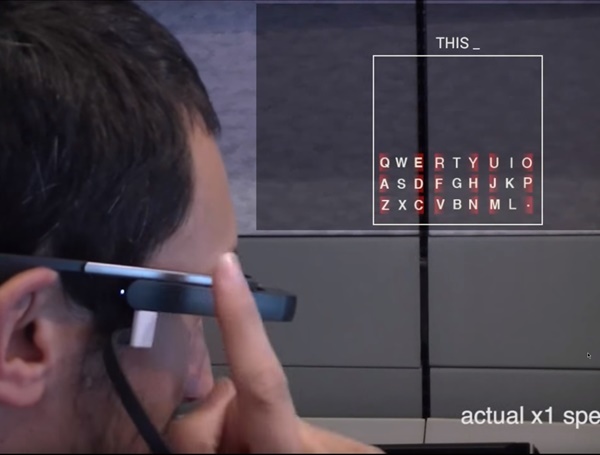 However, many smart eyewear devices are now including a side touchpad making gesture-based text entry feasible. The Swipeboard technique, recently proposed for ultra-small touch screens such as smart watches, may be particularly suitable for smart eyewear: unlike other recent text-entry techniques for small devices, it supports eyes-free input. We investigate the limitations and feasibility of implementing Swipeboard on smart eyewear, using the side touch pad for input. Our first study reveals usability and recognition problems of using the side touch pad to perform the required gestures. To address these problems, we propose SwipeZone, which replaces diagonal gestures with zone-specific swipes. In a text entry study, we show that our redesign achieved a WPM rate of 8.73, 15.2% higher than Swipeboard, with a statistically significant improvement in the last half of the study blocks.